The Fly Fishing Shop�s goal is to provide the best fly fishing schools in the world. The Trout School provides the most basic instruction to get you started with a solid foundation for your fly fishing endeavor. 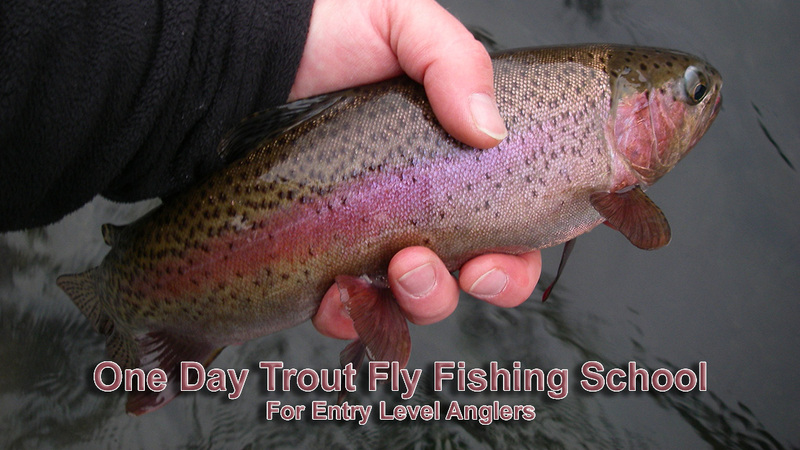 Whether you are a neophyte wanting to get into fly fishing, but not sure where to start, or an aspiring fly fisherman wanting to hone your skills, The Trout School will provide everything you need to know to embark on a lifetime of angling pursuits. Even better, our lessons are conducted in our dedicated training facility located within our impressive retail store. Our professional teaching staff has vast experience fishing for trout over many years and at many locations from giant glacial lakes and big brawly rivers, to tiny woodland ponds and dainty mountain streams. Our location is set in the heart of the fabled Mount Hood Country with 40 fisheries available nearby, and both the Pacific Coast and Central Oregon are just a short drive away. For the person who wants to become a well-rounded angler, we provide a community of great instructors, well thought-out classroom materials, and a great organization. The goal behind The Trout School Series is to leave you with a feeling of competence, confidence, and a passion for fly fishing. The Trout School is fast moving, and well organized. The principles governing casting and entomology will be covered in our dedicated classroom facility. This is followed by plenty of stream-side instruction to cover casting and reading-the-water techniques. Our class material is top notch, well thought out, well paced, and sufficiently broken down so that both the neophyte and someone more seasoned can appreciate while having fun in a positive and productive environment. Our dedicated instructors are attentive, knowledgeable, friendly, and most of all, able to tailor to your specific casting needs. Learn all the basics of fly fishing that you can now build upon. Cancellation policy: Payments are non-refundable, but are transferable to a replacement student taking this school on the same date. Classroom presentation: Equipment and accessories. End of one day class. Question: What is the best time of year to fish? Answer - Late April through October is when the most reliable hatches come off, but any time through the season can be good. Fly fishing is year round. Question: What should I bring to the class? Answer: A hat and eye wear protection, preferably polarized for fishing. Question: When does the school start and end? What will we be doing during the day? How long will we be fishing? Answer: Refer to the school itinerary for the schedule. Question: What is included in the price of the school? Answer: Use of rental fly rods/reels, leaders, flies. Waders can be rented. Answer: Lunch is the only meal included in the school tuition price. Answer: No. Lodging arrangements are made separately by the students. Question: Where can I stay? Question: How many people will be in the class? Answer: The maximum is 4 students, always with a ratio of one instructor for every four students. Question: Do we stop the school because of weather? Question: How much time is spent in the classroom vs. casting and fishing? Answer: See school itinerary on specific school page. Question: Can you bring your own equipment? Answer: Yes. Note that mandatory eye-wear protection is required for the stream-side casting instruction. Question: Is this class for intermediate anglers? Answer: Yes. In casting, we adjust our instruction to the individual student�s level. Question: How old do my children have to be to join me in this fishing school? Answer - We recommend 12 years of age. Question: What is the cancellation policy? Answer: Payments are non-refundable, but are transferable to a replacement student taking this school on the same date. Question: What other recreation is available near the school? Answer: The Mt Hood area has all year skiing, many hiking and biking trails, and nearby Portland culinary experience. Fly fishing is year around. Question: Will I be able to attend the same class as my son/wife/etc, even though I am an intermediate and they are a beginner? Question: Are there opportunities for guided fishing afterwards?